On the anterior inferior midline region of the hemimandible body is a triangular thickening of bone termed the mental protuberance. The thickened inferior rim of the mental protuberance extends laterally from the midline and forms 2 rounded protrusions termed the mental tubercles. Located lateral to the midline on the external surface are the mental foramina that transmit the mental nerves and vessels. They usually are located below the apex of the second bicuspid and have 6-10 mm of variation in the anteroposterior dimension. The rim of bone lateral to the mental tubercles extends posteriorly and ascends obliquely as the oblique line to join the anterior edge of the coronoid process. The inferior rim of the posterior body thickens and flares laterally where it attaches to the masseter muscle. Just lateral to the symphysis on the inner surface of the mandible are 2 paired protuberances termed the superior and inferior mental spines. The genioglossus muscle attaches to the superior mental spines, and the geniohyoid muscle attaches to the inferior mental spines. Just lateral to the inferior mental spines on the inferior border of the mandible are 2 concavities called the digastric fossae, where the anterior digastric muscles attach. Extending obliquely in a posterosuperior direction from the midline is a ridge of bone called the mylohyoid line, which serves as the attachment site for the mylohyoid muscle. Above and below the mylohyoid line on the inner mandibular body are 2 shallow convexities against which the sublingual and submandibular glands abut, respectively. Medial to the ascending edge of the anterior ramus is the retromolar trigone, located immediately behind the third molar. The ramus extends vertically in a posterosuperior direction posterior to the body on each hemimandible. The mandibular angle is formed by the intersection of the inferior rim of the body and the posterior rim of the ascending ramus. The superior ramus bifurcates into an anterior coronoid process and a posterior condylar process. The concavity between the 2 processes is called the mandibular notch. The coronoid is thin and triangular. With the teeth in occlusion, its superior extent is medial to the zygomatic arch. The coronoid is the site of attachment of the temporalis muscle. Inferiorly, the condylar process has a narrow neck that widens to a globular head that articulates with the glenoid fossa of the temporal bone. On the medial surface of the ramus, just below the mandibular notch, is an aperture termed the mandibular foramen; the inferior alveolar nerve and blood vessels run through this aperture. Just medial to the mandibular foramen is the lingula, a triangular bony protuberance with its apex pointing posterosuperiorly toward the condylar head. Extending anteriorly and inferiorly from the mandibular notch toward the inferior rim of the body is the mylohyoid groove, through which the mylohyoid nerve runs. 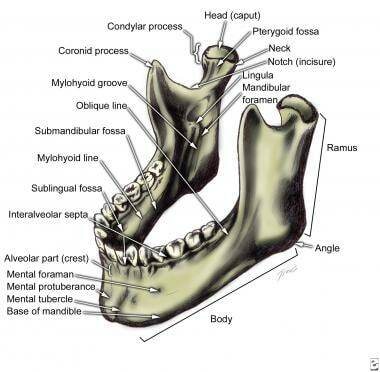 The mandible has a large medullary core with a cortical rim 2-4 mm thick. The inferior alveolar canal begins at the mandibular foramen and courses inferiorly, anteriorly, and toward the lingual surface in the ramus. In adults, the canal comes in close proximity to the roots of the third molar. In the mandibular body, the canal courses along the inferior border close to the lingual surface. Anteriorly, the canal runs typically inferior to the level of the mental foramen, to which it ascends at its terminal end. The mandible houses the lower dentition, which in adults consists of 2 central and 2 lateral incisors, 2 canines, 2 first and 2 second premolars, and 3 sets of molars. Interdental septi run between the buccal and lingual cortices of the mandible, and interradicular septi run between the mesial and distal roots of the molars. In the midline of the anterior surface of the maxilla is found a prominence, called the anterior nasal spine, with a lateral concave rim, called the nasal notch, that forms the floor of the piriform aperture. Inferiorly, the alveolar process of the maxilla houses the teeth, including central incisors, lateral incisors, canines, 2 premolars, and 3 molars in adults. The tooth roots form vertical, wavelike eminences in the anterior face of the maxilla; the canine root is the most prominent. The canine root forms a vertical ridge, termed the canine eminence, in the anterior face of the maxilla. The shallow fossae medial and lateral to the canine eminence are called the incisive fossa and the canine fossa, respectively. Superiorly, the maxillary bone is thickened in an inferior concavity that forms the infraorbital rim. Approximately 5-7 mm inferior to the rim lies the infraorbital foramen, which transmits the infraorbital nerve and vessels. The infraorbital rim extends medially and upward to form the frontal process of the maxilla. The frontal process articulates superiorly with the frontal bone, medially with the nasal bone, and posteriorly with the lacrimal bone. It has a smooth orbital surface that forms the vertical anterior lacrimal crest. Immediately posterior to the anterior lacrimal crest is a groove that forms the nasolacrimal canal. 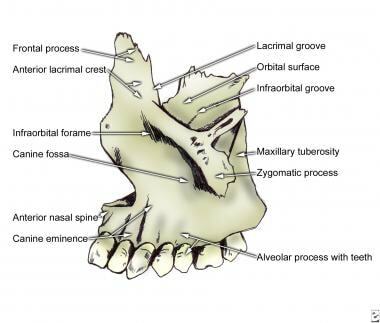 The maxilla projects laterally to form the zygomatic process, which articulates with the zygoma to form the lateral portion of the inferior orbital rim. Viewed medially, the maxillary sinus is evident with its medially facing ostium. It articulates with the palatine bone posteriorly and with the ethmoid, lacrimal, and inferior concha bones medially. In front of the maxillary sinus is a vertical nasolacrimal groove that forms the nasolacrimal canal with the lacrimal bone posteriorly and terminates inferiorly under the attachment of the inferior concha. The superior surface of the maxilla forms the medial floor of the orbit. Posteriorly, the free edge forms the anterior border of the inferior orbital fissure. 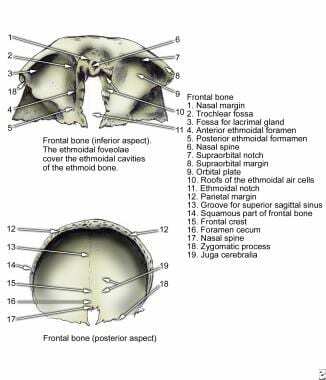 Medially, the orbital surface articulates with the ethmoid bone and lacrimal bone. Behind the frontal process of the maxilla and its anterior lacrimal crest is the nasolacrimal groove. Laterally, the orbital surface articulates with the orbital surface of the zygoma. On its inferior surface, the maxilla has a horizontal palatine process that forms the bulk of the hard palate. The palatine processes of both maxillae articulate with each other in the midline and with the horizontal plate of the palatine bone posteriorly. Anteriorly in the midline articulation of both palatine processes is the incisive canal, which transmits the nasopalatine nerve and branches of the greater palatine vessels. From a medial view, the maxillary hiatus is evident, opening into the maxillary sinus that occupies the predominant portion of the body of the maxilla. The masseter muscle acts to close the mandible for mastication and speech. On its lateral surface, the zygomatic bone has 3 processes. Inferiorly, a concave process projects medially to articulate with the zygomatic process of the maxilla, forming the lateral portion of the infraorbital rim. 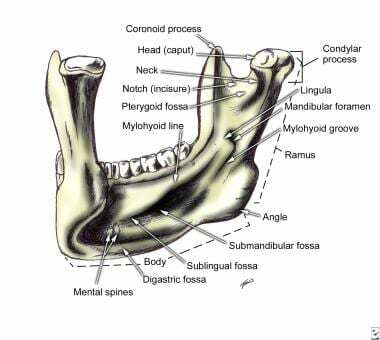 This concavity projects superiorly to form the frontal process that articulates with the frontal bone. Posteriorly, a temporal process articulates with the zygomatic process of the temporal bone to form the zygomatic arch. On the medial surface of the zygoma is a smooth orbital plate that forms the lateral floor and lateral wall of the orbit. It articulates posteriorly with the greater wing of the sphenoid bone. 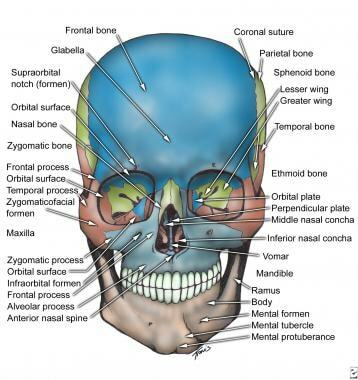 The frontal bone forms the anterior portion of the cranium, houses the frontal sinuses, and forms the roof of the ethmoid sinuses, nose, and orbit. 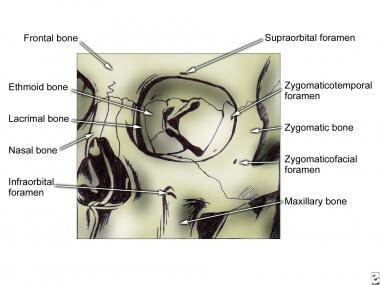 Inferolaterally, the supraorbital ridge forms the zygomatic process that articulates with the frontal process of the zygomatic bone. The inferior surface of the frontal bone forms the concave surface of the orbital roof and the anterior nasal roof. The internal surface of the frontal bone is concave anteriorly, with grooves laterally for the middle meningeal vessels. The floor of the internal surface forms the floor of the anterior cranial fossa. It has a midline dehiscence termed the ethmoid notch that articulates with the ethmoid bone. (See the image below.) Anterior to the ethmoid notch is an upward sloping ridge termed the frontal crest, which forms a groove for the superior sagittal sinus. At the anterior articulation between the frontal crest and the cribriform plate of the ethmoid bone is a small foramen called the foramen caecum, which usually transmits an emissary vein from the roof of the nasal cavity to the superior sagittal sinus. Frontal bone, inferior and posterior aspects. The frontal sinus begins to form after age 3.5 years. It is located in the anterior midline, between the supraorbital rims. In adults, the average dimensions reach 2.4 mm high, 2.9 cm to either side from the midline, and 2 cm in anteroposterior dimension. The anterior wall of the frontal bone splits to enclose the sinus, but the anterior and posterior walls retain their diploë. The frontal sinus usually is divided sagittally by a frequently eccentric septum. Just lateral to the midline, the bone of the anterior wall of the sinus is 4 mm thick, and the bone of the posterior wall is 1.9 mm thick. The paired nasal bones form the anterosuperior bony roof of the nasal cavity. They are approximately quadrangular. They articulate with the nasal process of the frontal bone superiorly, the frontal process of the maxillary bone laterally, and with one another medially. Their inferior border is free and forms the superior margin of the piriform aperture. The external surface is convex except for the superior-most portion, where a concavity forms as the margin turns superiorly to articulate with the frontal bone. On the internal surface is a vertical groove for the external nasal artery. Berkovitz BK, Moxham BJ. A Textbook of Head & Neck Anatomy. 1st ed. Mosby-Year Book. 1988. Bron AJ, Tripathi RC, Tripathi BJ. Wolff's Anatomy of the Eye and Orbit. 8th ed. Philadelphia: Lippincott Williams & Wilkins. 1997. Dutton JJ. Atlas of Clinical and Surgical Orbital Anatomy. Philadelphia: WB Saunders Co. 1994. Lang J. Clinical Anatomy of the Nose, Nasal Cavity, and Paranasal Sinuses. NY: Thieme Medical Publishers. 1989. Netter FH. Atlas of Human Anatomy. NY: Novartis Medical Education. 1989. Rohen JW, Yokochi C. Color Atlas of Anatomy. Philadelphia: Lippincott Williams & Wilkins. 1988. Haribhakti VV. The dentate adult human mandible: an anatomic basis for surgical decision making. Plast Reconstr Surg. 1996 Mar. 97(3):536-41; discussion 542-3. [Medline]. Beaty NB, Le TT. Mandibular thickness measurements in young dentate adults. Arch Otolaryngol Head Neck Surg. 2009 Sep. 135(9):920-3. [Medline]. Miller PJ, Smith S, Shah A. 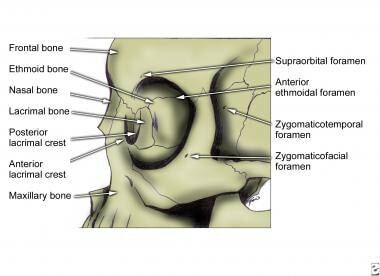 The subzygomatic fossa: a practical landmark in identifying the zygomaticus major muscle. Archives of Facial Plastic Surgery. 2007 Jul-Aug. 9(4):271-4. [Medline]. Webster RC, Gaunt JM, Hamdan US, et al. Supraorbital and supratrochlear notches and foramina: anatomical variations and surgical relevance. Laryngoscope. 1986 Mar. 96(3):311-5. [Medline]. Prabhu LV, Ranade AV, Rai R, Pai MM, Kumar A, Sinha P. The nasal septum: an osteometric study of 16 cadaver specimens. Ear Nose Throat J. 2009 Aug. 88(8):1052-6. [Medline].